Task Coach, an open source program for managing todo lists, is available in version 1.0.0. The Task Coach release includes the new calendar view feature for tasks. It also provides partial drag-and-drop support for Mail.app in Mac OS X. Task Coach meanwhile is celebrating its fifth anniversary with 1.0.0. The GUI application is written in Python and runs under Linux, Windows, Mac OS X, iPhones and iPod Touch. For the two latter platforms there is even a small application that synchronizes with the desktop version. 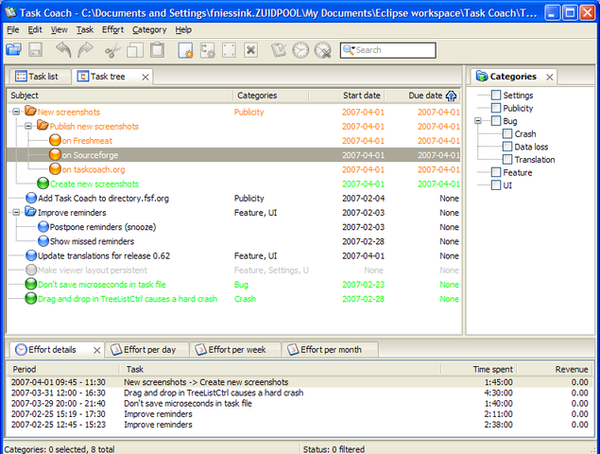 Tasks and notes can also be synchronized over a Funambol cloud server. Task Coach runs under various operating systems and allows tasks to be subdivided into activities. The program manages tasks and their related activities, can display them as lists or trees, and can sort them by various attributes. The file format (.tsk) is in a native XML, with export to HTML, CSV and iCalendar available. Task Coach also supports attachments and notes. The software is under GPLv3. The Task Coach homepage provides details as well as downloads of binaries and source packages. Thanks to its compact interface, the Osmo PIM application is perfect for small screens. We help you make the most of Osmo.